Mentorship: the “hot” word on the street for new graduates looking to enter the job market. Yes, you can choose to apply for a residency and you will get plenty of one-on-one mentorship hours, but often times students are burnt out by the time the word “residency” rolls around and just want to start practicing what they have learned for the past 7 years. Many employers offer PT "mentorship,” only for you to find out the mentor either doesn’t provide hands-on learning opportunities or your schedule is too busy to squeeze in quality learning time. So how do we find it? How do we know the clinic we are applying to really offers that mentorship that we as new graduates so desperately need? The great thing about the world of the internet is that there are so many great and accessible therapists, and even if your new employer doesn’t offer formal mentorship, you can and should get it from someone else. We even had a great YouTube Live all about mentorship for new grads! As you begin to look for your first job or even for those a few years out who are still looking for that missing piece, here are a few ways how to find legit mentorship and the questions you should ask. So to start, where can you find mentorship? As a new graduate, I was really seeking “informal” mentorship at the place I decided to work. I wanted to be surrounded by physical therapists who are experts at what they do and be in an environment where therapists are willing to teach what they know. I was so fortunate to find this at the clinic where I currently work, and it’s important before starting a job to ask the clinic manager what the experience and knowledge level is of the therapists. Also, keep in mind just because the therapist may only be a few years out does not mean that they are not skilled or experienced. In fact, some of the smartest therapists I know have graduated within the last 5-10 years. The staff wants you to succeed, and most clinic managers want to invest in you as a therapist. It is important to be upfront before accepting a job and express to the clinic manager your goals, aspirations and expectation levels in regards to mentorship. 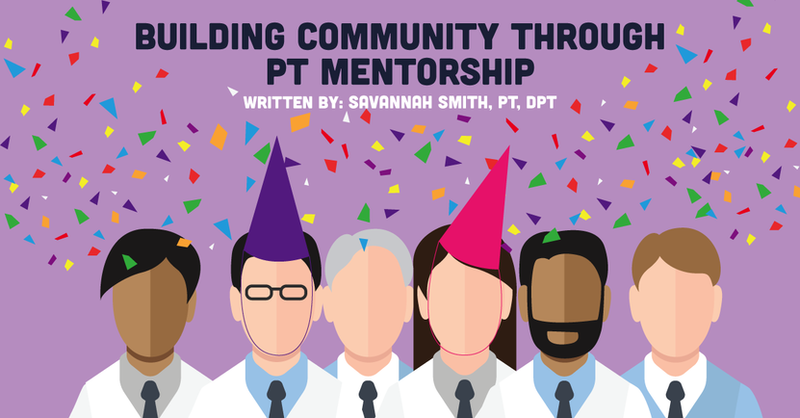 Let them know that finding a great physical therapy mentor is important to you! As I said, it doesn’t have to be structured to be effective, but I do believe it is important for a new graduate to be eased in and to be able to talk to any of the therapists they work with about complex patient cases. I have seen many of my classmates be promised mentorship, only to be in a clinic by themselves at the end of the day. It is important to complete your due diligence. How long is the “mentorship” that’s promised offered? Are you assigned a therapist? Are your schedules blocked off for any time to discuss patient cases? These are all important questions to ask your employer when mentorship is brought up in conversation. I want to give a large shout out to my musculoskeletal professors. They did an incredible job of preparing me for my clinicals and beyond that, as I began to navigate my life after PT school. I would also encourage you DPT students to not just talk to your professors about assignments but talk to them about the real world life as a physical therapist. They are not only your professors; they are also your future colleagues. I can’t even count the number of times I talked to my professors about whether I should do a residency, what job I should take, or how to develop my skills further after graduating. I would not be the clinician I am today without their support and guidance, and I believe have ultimately led me to the job I am in right now. They are not only your professors; they are also your future colleagues. They want you to succeed and represent the school in the best possible way. They also have many professional connections, and I have seen this firsthand. It is astonishing to me how small the PT world is, especially the “brotherhood” made up of sports physical therapists. I have made a large number of connections through my professors, and networking is so imporant for PTs. Plus, if one area of physical therapy sparks your interest, talk to your professor who specializes in it! Throughout my academic career, I was blessed to have a few mentors, most being my clinical instructors. They helped me gain opportunities such as working with the University of Florida athletic teams, working as a research assistant for a concussion study, and eventually working with the Pittsburgh Pirates during spring training! Working in sports can be super rewarding, and if you love sports as much as I do, check out these reasons for working in an elite sports clinic. It's also important to consider not just the therapy side of our profession, but the work-life balance portion of having a full-time job. I was fortunate to grow up with a mom whose job was flexible, and she was able to pick me up at school at 3:00 P.M. every day. However, if you work in an 8-5 job (or for a sports team which is my ultimate goal) this probably will not happen. I talked with my first clinical instructor about raising a family as a full-time worker, managing finances, juggling life experiences in general, and even dating another PT (this can be a whole other article in itself). I quickly realized, after my first paycheck, that life is not always greener on the other side of graduating (literally). It is important to be prepared not just as a physical therapist, but for life itself. In addition, you can find mentors in other folks, not just your clinical instructor. If you know a physical therapist who has progressed in a career path that you would want to follow, approach them and ask them how they got to where they are. I speak from personal experience! I was pretty miserable in my acute rotation (shout out to those hospital PTs; it's harder than it looks), and I reached out to the Pittsburgh Pirates Minor League Rehab PT since their spring training facility is in my hometown. He met with me and told me what experience I would need to get into his position and what to do to set myself apart from other new graduates. This one hour conversation ultimately led to an eight week long, unofficial internship with the Pirates during spring training. I could not have learned all I know now about rehab injuries in baseball and the daily grind these players engage in without it, and I am so grateful for the experience because I now have made connections that may lead to my ultimate career goal. The little conversations you have may lead to opportunities down the line. So take each experience and learn from each and every one of them. PT school will give you a foundational knowledge of physical therapy, but I do believe that new graduates lack advanced clinical thinking skills and hands-on experience. This is not to say we are not smart or are mediocre at what we do, but there is no denying that a residency or fellowship will accelerate your learning process by three to five years. While this is not a necessary route to take, I have chosen to partake in a sports and orthopedic manual therapy certification and here is why: there is a huge learning curve after you graduate, and you may think you know a lot, but in reality, new graduates have so much more to learn. I wanted a fast track to get to where I want to go, and I believe a fellowship will help me develop the hands-on skills and clinical reasoning ability that I need and want in order to work for a collegiate or professional sports team. In addition, you are guaranteed that mentorship time that so many new graduates truly want. I don’t think residency or fellowship is ideal for everyone, but I would strongly encourage you to think about what you want and your career goals. I think the most important thing is to find the residency or fellowship that is right for you. However, do not just do a residency or fellowship to get those three or four letters behind your name: do it because you want to grow and develop your clinical and professional skills as a physical therapist. Do it for the sake of your patients, whether they be that top prospect pitcher or the 65-year-old patient with knee osteoarthritis. Having a good mentor is critical as a new graduate to help develop your clinical skills and accelerate your personal and professional growth. I encourage you all to seek out one, whether you are a new graduate, a therapist a few years out, or even an experienced therapist who wants to continue to learn more. And for those who are experts now, I hope you can return the favor to us new graduates looking to find someone to take us under their wing.